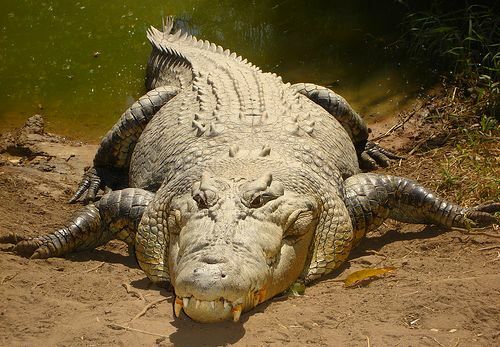 Australian Saltwater crocodiles are by far the most dangerous animals in Australia. They are huge, aggressive, territorial, and plentiful across the north of the Australian Outback. 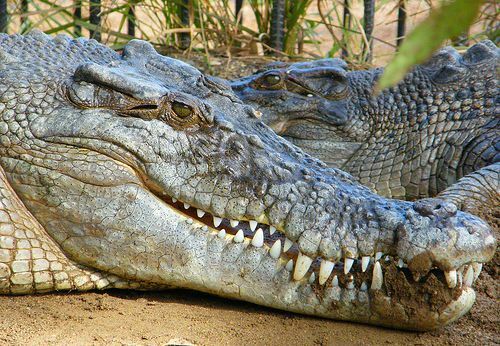 Our crocodiles kill on average one to two people per year! On this page you can learn about Australian saltwater crocodiles, their life, their habitat and their conservation. You don't need to be paranoid about crocodiles, paranoia never helps. But you do need to be aware of the danger if you travel in the northern Australian Outback. But only the populations in Australia and PNG are stable. Illegal hunting and habitat destruction has severely depleted their numbers elsewhere. In fact, anything over 5 metres is rare, but that is more than big enough anyway. This is a large headed species with a heavy set of jaws, and the jaws can exert a pressure of several tons. 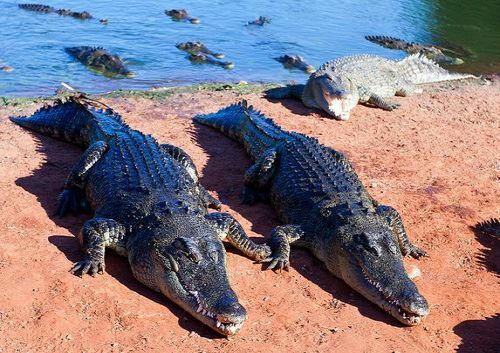 "Salties", as we "Aussies" call these Australian crocodiles, eat mainly small reptiles, fish, turtles, wading birds etc..., but they can also kill and eat much larger prey. They are known to take wild pigs, buffaloes, and also live stock like cattle and horses. 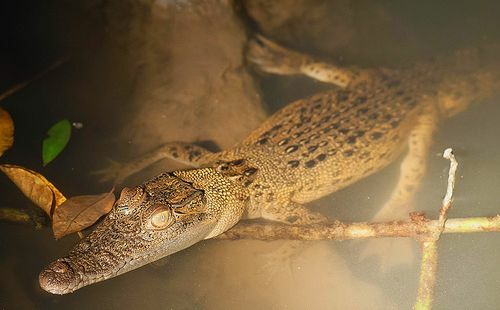 Breeding and raising of the young saltwater crocodiles actually happens in freshwater areas. Between November and March the female lays 40 - 60 eggs in a nest made from plant matter and mud on a river bank. The location of the Australian crocodile nests is sometimes used as an indication of how much rain can be expected during the upcoming wet season... But the crocodiles don't always get it right. Many nests are flooded every year, killing the embryos. When the little crocs are about to hatch they make chirping sounds in their eggs, and the mother helps them by digging them out of the nest. Then she takes the hatchlings to the water's edge in her mouth and from here on watches over them until they are able to look after themselves. It takes females 10 to 12 years, and males 16 years and more to reach maturity... Despite mum's caring ways less than 1% of the hatchlings will get there. Predation by turtles and goannas takes its toll in the early days, and later on the juveniles are often killed and eaten by territorial mature males. You might have heard or read that today there are more Australian saltwater crocodiles living in the Northern Territory than Territorians. I'm not sure about that, but there are certainly more crocodiles than people where I live, in the Kimberley in Western Australia. 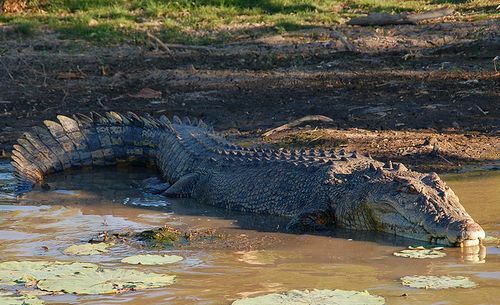 The Australian crocodile population is estimated to be over 150,000. It makes Australia a major stronghold of the species, and possibly the only one. Things didn't always look so good for our saltwater crocodiles. From the late 1940s to the 1970s extensive hunting for their hides (the most valuable of all crocodile skins) had reduced their numbers to a critical level. Their reputation as a man-eater didn't help them much either. 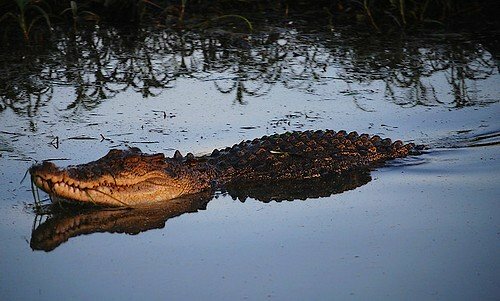 The two facts combined made crocodiles just about disappear in other countries that previously had healthy populations. When the Australian crocodiles were finally made a protected species their numbers slowly recovered. Today several breeding programs exist in Australia, for skin and meat production. For this Australian crocodile eggs are collected from the wild. The egg collection so far hasn't shown any detrimental effect on the population numbers. Neither has the permission of limited hunting that was given to native people of the area. The numbers are so good that some regulated trophy hunting is being discussed. Aggressive trapping of problem crocodiles and their removal to Australian crocodile farms has reduced the numbers of conflicts between humans and reptiles. Despite the trapping and ongoing education campaigns there are many calls by residents to shoot the b......s again. I know, because I live in serious crocodile country. All of the Kimberly with its abundance of tidal rivers is perfect habitat for Australian crocodiles. I moved here over 12 years ago. Back then it was safe to swim in our lake, and in several places along some rivers. Not any more... The territorial nature of the males requires every mature male to have its own territory. As saltwater crocodile numbers increase they move further and further inland, and closer and closer to human settlements. We have been watching it with our own eyes for years. The potential for conflict is certainly there. Monitoring and trapping helps, but it doesn't eliminate all risk. Acting crocodile safe is paramount in the north. Being careless can be fatal. Read about saltwater crocodile attacks in Australia.